I know where this one is! M90-something, so it must be in Scotland. No? Where is it then? It's near to Moreton-in-Marsh, Gloucestershire. Right... Can you show me where it is on a map? There's no motorway there! You're making this one up. Try the aerial photo then. No, I still can't see anything, just an airfield. OK, let me give you a little bit more information about the M96 then. This motorway, although tiny, and unknown to the world at large, is as important as any of the major motorways in the country, like the M1 or M6. It isn't open to the public, but is the only motorway that can actually help to save lives in a proactive manner. Simple, really. It's part of the Fire Service College, which is one of the world's best training establishments for fire-fighting personnel. At the college, they (obviously) have many scenarios to help with the training, which includes buildings, aircraft and helicopters, a railway, a ship, and even an oil terminal. Firefighters come to the college from all over the world, with as many as 700 students attending at any one time. 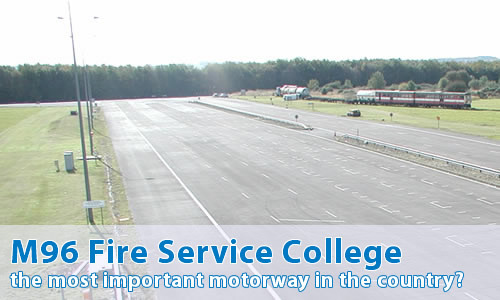 The M96 is one of these scenarios - a full-blown motorway in the middle of the college! It is used to simulate road traffic incidents; the college has a supply of vehicles specifically for this purpose. It's about a mile long, and has two different width carriageways, one three lanes wide and the other six. The level of detail on it (as well as the rest of the FSC) is really rather stunning - it's fully signed, has SOS phones, distance marker posts, a crossover point between the carriageways (as is found on older motorways), speed camera markings and cat's eyes. The M96 is even signed correctly from elsewhere in the college! As well as its duties for Fire Service training, it is used extensively by the Highways Agency in order to test ideas - it's fully kitted up with MIDAS, which is used to monitor traffic flow and warn of congestion, and even has an ATM layby. In every way possible (visually at least), it is a slightly disconcerting functioning replica of a "live" motorway - to such an extent that it is regularly used for filming purposes - you can often see it on advertisements, and it has been used in BBC drama programmes. As an aside, many sources erroneously state "M91" for this motorway. Oh yes, there's a photo gallery. Beware that due to health and safety reasons, it is not normally possible to visit the site. Yes, they're in the Comments Archive. Thanks to Sally Waskett, Margaret Fuller, Laura Merris and the Fire Service College for their assistance, without whom this page would not have been possible.